If you have little ones (or can remember when your own children were little), you can remember how vital that afternoon REST proved to be. It ensured a happy afternoon and the absence (or lessening) of melt downs at the end of the day. It gave you some quiet during your day to regroup and focus. Resting has been on my mind a lot. 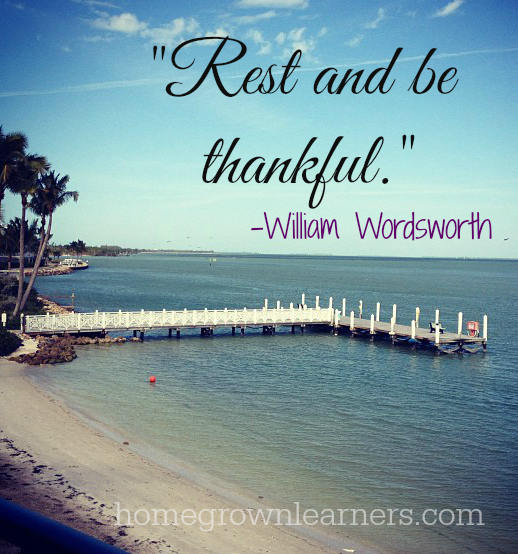 My home online, Homegrown Learners, will be quiet next week as I REST. For the first time since I began this blog, I will take a break. I will unplug (well, I might have to Instagram some moments because I love to capture life on my camera phone!) for some much needed quiet. I'm fairly certain the internet will continue to function without me. We are fortunate enough to be able to spend a week at the beach - first a few quiet days just the four of us, and then a few days with my mom and dad in my hometown. The past six months have brought great health challenges to both of my parents. I am anxious to spend time with them and for the kids to spend time with their grandparents. We will celebrate Anna's 13th birthday with an excursion with dolphins and hamburgers and malts made by grandma and grandpa. We will read books, watch movies, lay on the beach, swim, and probably eat too much. Hopefully I will be able to put aside so many things that are looming in my mind right now (all of them good things - but looming nonetheless). Because you see - this REST will make me a better wife, mother, and teacher. It will make me a better friend, church member, and neighbor. I am so thankful everyone in my family loves to read. We are choosing our books for vacation and eagerly anticipating time for getting lost in good books. If it comes to mind would you pray our family has safe travels, fun adventures, and lots of time for making memories? These are the important things of life, and I want to cherish each moment.